Personally I would choose All Hallow's Eve , not for power reasons, but because it would be a fun throwback reference. 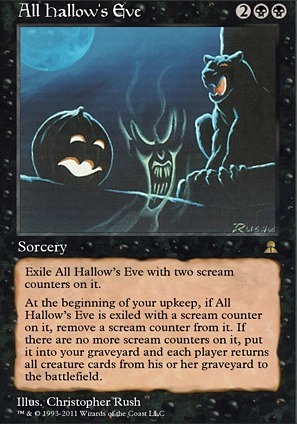 All Hallow's Eve is a strange little card--it has only ever been printed as a sorcery, but, for a while, it had errata to make it an enchantment. It would be kind of fun to have an enchantment that used its old enchantment text. 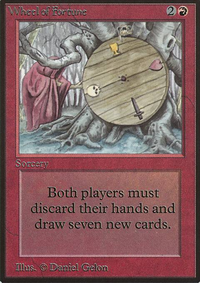 There is one advantage to having individual entries--someone might design a deck where they only ever intend to cast one half of the card, and thus do not want the combined cost messing with their deckbuilding analytics. However, there is an easy fix--the "Alternate Values" tab when deckbuilding. 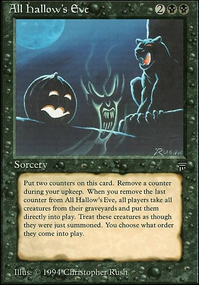 I think it might be helpful to add an option for alternate card type, so you can specify if you want your split cards to display as instant or sorcery; or your Bestow creatures to display as an enchantment; or to pretend Wizards did not revert All Hallow's Eve to a sorcery after its brief stint as an enchantment. goldlion I like the way your thinking, and plus it's so janky no one can hate it LOL! Regrowth, Oversold Cemetery, Animate Dead, Dance of the Dead, Athreos, God of Passage, Dawn of the Dead, Disturbed Burial, Dread Return, Golgari Guildmage, Meren of Clan Nel Toth, Palace Siege, Phyrexian Reclamation, Debtors' Knell. Reanimate, Necromancy, Corpse Dance, All Hallow's Eve, Genesis, Sheoldred, Whispering One. Harashiohorn on One-Trick Pony: Lazav! Entomb is just too good to not run. Phyrexian Dreadnought combo's well with Lazav, since when he copies the ETB doesn't trigger, and playing it but failing the ETB makes it go right to the yard to enable the combo. Invisible Stalker lets you give hexproof easily. 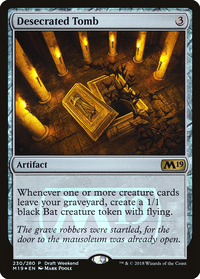 Going in another direction, Glimpse the Unthinkable and other mill cards provide a way to quickly stack your graveyard, while Phyrexian Reclamation and Recall let you recur the things you want back. If you're stacking your graveyard you might as well add in Living Death, type effects (Bonus points for All Hallow's Eve). Tainted Strike gives Infect as another means of grabbing that 1 hit kill. Warped Physique can be either a pump spell or removal once you've gotten your graveyard full. Mortal Combat provides a fun alternative wincon, if you want. Wonder and Filth both give you benefits just for being in your graveyard. For protecting your graveyard, your best bet is probably just counterspells. Things like Silent Gravestone only work with non-targeted reanimation. You have 2 Nyxathid listed. 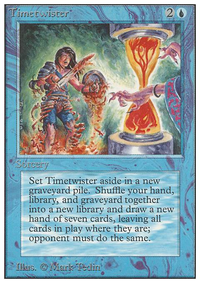 All Hallow's Eve would work well, yes it also brings back your opponents creatures but you should have more and better creatures.Artisan of Kozilek,Journey to Eternity Flip,Breath of Life,Corpse Connoisseur, Dawn of the Dead would all fit your theme. I'm going to point out All Hallow's Eve, but I'll make a new card. Will of the council - Starting with you, each player votes for trick or treat. If trick gets more votes, each creature you don't control loses all abilities and has base power and toughness 0/2 until end of turn. If treat gets more votes or the vote is tied, creatures you control have base power and toughness 4/4 and gain trample until end of turn. Create a card for a holiday you celebrate, not including one that's been done already. Ares111123 Great suggestions! I actually have a Nykthos but I'm using it in my mono-red deck right now. I may invest in another one soon. Sensei's is also in the mono-red only cause that needs more help with cycling through the deck. 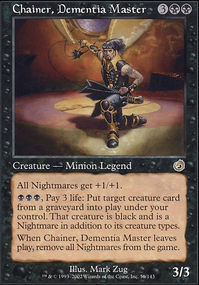 I definitely want to take out Serum Visions for something better (in the name of draw). I may add Erebos, but I'm more inclined to put in a Phyrexian Arena in. Do you think I should run the arena and Rhystic Study? Also not sure how I feel about Fallen Ideal but in the right acenario it gives Grimgrin flying and it is also an alt sac outlet. Right now I'm planning on adding an All Hallow's Eve for some awesome flavor, and maybe a Lake of the Dead. What do you think about Secrets of the Dead? I have it and have toyed with the idea of using it. Hahah. No doubt Regoober! I dig that idea. Recently my more serious decks have been hated off the table, so I figured that something fun and vorthos would at least have a chance to hang around a while. Great idea on the All Hallow's Eve. I've never proxied before, but this may be a case for that.